CascadiaNow! 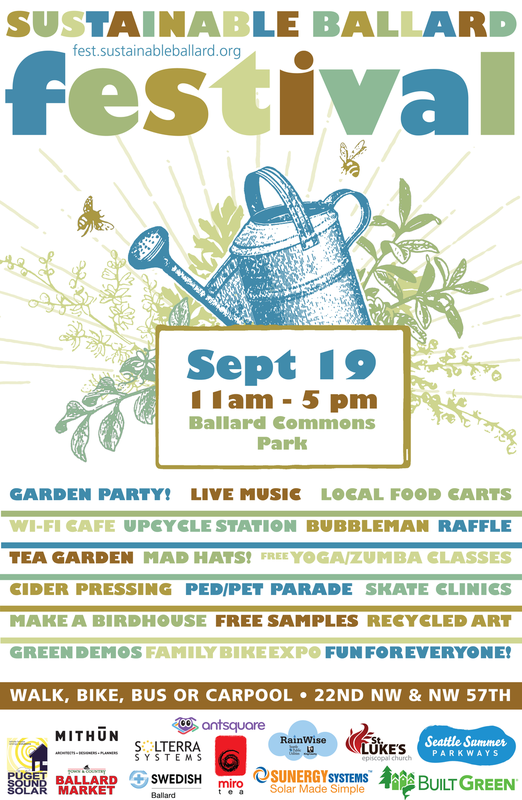 had a lovely Saturday joining with dozens of other oganizations for the 12th Sustainable Ballard Festival that took place September 19th, 2015 in Ballard Commons Park. CN! set up a lovely table, handing out free stickers, maps, information about Cascadia and sponsored projects, and had the opportunity to chat with hundreds of folks as they passed by. The positivity – from those just hearing about the idea, to those who had heard loosely of it – to those already way behind the idea – blew us away! We were so excited by all of the responses. The 12th Sustainable Ballard Festival was a family-friendly, FREE, one day event, sponsored this year by Built Green. Activities included a learning stage, performances, bands, workshops, hands-on games, and dozens of exhibitors and tablers from different local ballard businesses and Seattle non-profits. The weekend was a fantastically fun opportunity to learn together, get inspired, and discover new ways to live more lightly on the earth. This year also served as the basecamp for the brand new Seattle Summer Parkways – a 7 mile loop featuring activities at a variety of stops along the way. Seattle Summer Parkways are free, all-ages events that last all day that open up streets to pedestrians and bicyclists to explore new transit coming to various areas, all while all while celebrating live music, vibrant community culture and activities all along the way. Next ArticleFirst Cascadia Bioregional Congress 1986 Proceedings Online!